Stanford Social Innovation Review: Stanford Social Innovation Review (SSIR) is an award-winning magazine and website that covers cross-sector solutions to global problems. SSIR is written by and for social change leaders from around the world and from all sectors of society—nonprofits, foundations, business, government, and engaged citizens. IDEO.ORG's The Human-Centered Design Toolkit from IDEO.org gives you a set of tools to design an innovative and effective solution to the social problem you're trying to address. 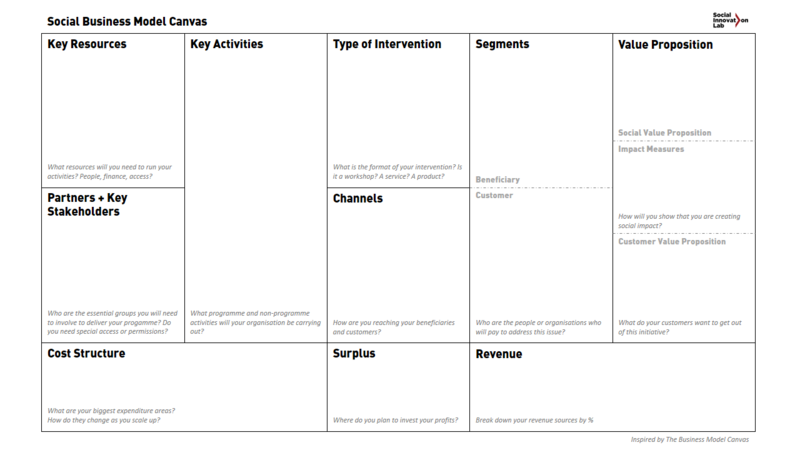 Tandemic's The Social Business Model Canvas, is a strategic management and entrepreneurial tool. It allows you to describe, design, challenge, invent, and pivot your social business model. The Collaborative is a 3-day immersive experience where today’s changemakers co-create the future of social entrepreneurship. Participants make meaningful connections with nonprofit leaders and peers—and head home with actionable strategies and tools to accelerate change.